A lot of my photos on this website are to document a technique or a project or are "shot from the hip" on layout tours and train shows where lighting can't be controlled. I don't go crazy trying to make the photograph as perfect as it can be. However, in past years and in several houses I lived in I had built complete darkrooms and photogaphy was a major hobby. I used to process my own film (Ansco for colour and Ilford for B & W) and would spend hours trying to get the perfect shot. I am by no means a professional photographer, but I have picked up a few things over the years. Much has changed since the introduction of digital cameras, DSLRs and image manipulation software like Photoshop. The basics, however, haven't changed much. For most of us, price is going to be a factor here. If you plan on doing indoor photos of trains on your layout, a good SLR (single lens reflex) 35mm camera will work fine. If you can afford the more expensive Digital SLR (DSLR), even better. A camera that allows you to change lenses is even more useful. For model train photography a wide angle lens is a good second choice. The depth of field is greater than a "normal" or medium focal length lens, but you have to be careful of distortion. I currently use a Canon Rebel T3i digital camera. Let's consider what you can do with your camera. As you'll be working close to your subject, depth of field (DoF) becomes a primary consideration, that is, keeping things in the foreground and background in focus. Without getting too technical, most simple point and click cameras have a medium type lens because most people are taking pictures of people, head and shoulders, or landscapes. The primary focal length has to be able to take in-focus pictures between about 8 feet and infinity. The cameras also assume that the average photograph is being taken on a sunny day or a cloudy-bright day so the exposure for the built-in lens is usually set to get a well exposed picture around f5.6 to f8 or f11. Previously, these settings were designed to accommodate films like Kodachrome that had a slow ASA of 25. Now digital cameras are all about pixels. ASA, ISO and such terms are a matter of how much light you can get on the subject during the exposure at a specific f-stop. It's always a trade-off. There are other issues such as graininess or noise on the image, a bit like the "snow" you'd get on a TV screen if the antenna couldn't pick up the signal well enough. setting on my camera that is designed for closeups. See how quickly the background goes out of focus. Essentially, the smaller the opening of the lens, the greater the depth of field. It is still possible to buy a "pinhole" camera attachment. For many years model train magazines advertised the Fricko lens (A.J. Fricko Co.). With any lens, you want to "stop it down" as much as you can, to f32 or even f64 if you can do so. Often this is not possible or you may need a long time exposure to get enough light onto the subject. As the f-stops become larger (more open), like f8 and f11 even, the depth of field decreases and objects start to go out of focus the closer the camera is to them. Many digital cameras have a macro or super macro setting that lets you get closer, for example, when you want to take a picture of a flower. But the background quickly gets fuzzy as in the photo above. There is a software program called Helicon that can stitch together several photos to increase depth of field, within limits of course. The idea is to take a series of photos focusing on items from foreground to background and then to use Helicon to compose a photograph with the best depth of fields. Based on the above, you can see that the smaller the lens opening, the longer it will take for the light to do its job. The key thing here is to use a tripod to keep the camera as steady as possible and use a cable release if you have one. Obviously, the less light there is, the more time it will take. 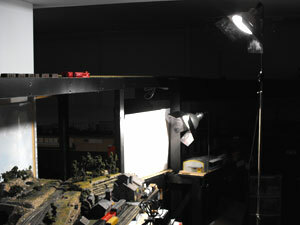 If you plan on taking model train photography "night" shots, plan for longer exposure times. The camera platform has to be rock steady to avoid blurring. Experiment with time exposures. Your camera has to be able to keep the lens open during this time. You manually open it and then close it. Some cameras will let you set the length it is open longer than the usual fraction of a second. Light has a colour. Morning light, daytime light and evening light are different. Pictures taken in the tropics will look different than ones taken in the northern hemisphere. Light has a colour temperature, usually measured in degrees Kelvin. Many cameras today let you set the white balance or you can use the auto feature to let the camera figure it out. Daylight high noon temperature is around 5600 degrees Kelvin while indoor incandescents are around 3200 or 3400. Fluorescents tend to have a cooler, bluer/greener light. The new energy efficient bulbs we're all supposed to use are basically fluorescents. Fluorescents, especially those tubes modellers often use above the layout as worklights, produce a more diffuse lighting and can make our models look flat and uninteresting. An option is to use strings of old fashioned incandescent Christmas tree bulbs behind your valence (if you can still find them). Incandescents produce more heat and are inefficient, ie, it costs more money to use them. Nowadays you can buy LED rope lights that allow colour variation. The cheapest way is to buy them direct from China because they can still be quite expensive in local hardware and lighting stores. There is some variation between fluorescents advertised as white, cool white, and other bulbs you can buy. We used to handle colour correction by adding filters in front of the lenses. Now you can do it on your digital camera or through photo editing software. It's still a good idea to put a UV filter on your camera or even a polarizing filter if you're shooting outdoors. Filters protect a lens, too. It's a lot cheaper to replace a scratched or damaged filter than to replace a lens. My advice, if you plan to shoot indoors, is to get some light stands and photofloods from a camera store and set your camera to the correct white balance. If you plan to take your work outside and shoot model train photography under natural daylight, your basic camera settings will usually work OK. A fill light may be necessary to dampen down harsh shadows. This is a big subject. The main problem is to get the lighting where you want it and keep it off of things you don't want to see. Shadows are often the culprit. Without getting into skrims, umbrellas, and other paraphanalia, let's just try to keep these model train photography tips in mind. Put away your flash to avoid hot spots. If you want to use a flash, angle it towards the ceiling so the light doesn't fall directly on the subject. Add a softening filter in front of the flash unit if it is an add-on flash. These are usually white plastic. Check if your camera has a "fill" setting. Or turn off the flash. It is preferable to use lights on a tripod or position them with clamps. You can control the direction of the light with "barn doors" attached in front of the lights. Note the high key light to act as the sun. at a sheet of white posterboard. to the right of the subject. The lights have "barn doors" to help control shadows. You can also hang a filter to soften the light. Set your key light high overhead the scene. If it is slightly behind the subject it gives more of a backlit effect. A slight backlight will make the scene "pop". I learned this from an article by renowned modeller, Malcolm Furlow, in an article in Model Railroader magazine back in the 80s. Direct a second light into a white card (or a photograher's umbrella if you're lucky enough to have one). Start close to the scene and slowly move the light back until the light has a pleasing balance. A light metre will help but you can go by eye. Malcolm suggested the fill light should be 2 f-stops less than the key light. One way of doing this is to use a 1000 watt bulb as your keylight and a 250 to 500 watt bulb for fill. What you're trying to do is have the key light act as the sun. This photo is taken from the right (lighted side). This photo is taken from the left (shadowed side). on the building are falling. The fill light fills in the holes to lighten up any harsh shadows. That's also why you want to bounce the fill light off a card. It's to keep the shadows from clashing. 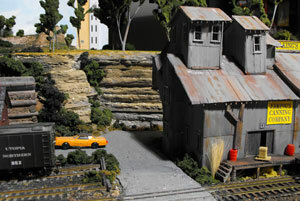 Find a scene on your layout you want to photograph and experiment. Keep track of what your're doing on a notepad. You can always read back all the camera settings on a computer, but that won't tell you what you did with the lights. Just try to learn to control the shadows. Well, not totally all-forgiving, but a program like Photoshop or other photo-editing program can bail you out of a lot of errors. You can crop, stitch, erase parts of the image, correct white balance and balance colours. I use Photoshop. It still can be tricky to get colours and white balance correct. That's why I suggest turning off the house lights and using lamps designed for photography. You also cannot correct for a blurred image. It's worth investing in some basic photo-editing software and learning how to use it. In the two photos above I rotated the images slightly to get the subject more level and then cropped the images. I also adjusted the brightness and contrast. I didn't touch saturation or colour balance. I had set these to be compatible with the lights I was using. I could also have removed the benchwork support that's visible in the background. You can get really fancy, like adding smoke effects or replacing figures with real people. But that's going to get you out of the train room and into another hobby! I'm not going to tackle this one here. You know what picture you want to take. Try to keep unwanted elements out of the shot (or at least use the software to get rid of them). Find a center of interest. Use the one-third/two-thirds rule of thumb, ie, don't have the centre of interest smack in the middle of the photo. Think of how someone's eye is going to get into the picture. We normally start at the top left and follow an "S' curve towards the bottom of the scene, sort of like following a river through a landscape. Many digital cameras let you choose a viewing screen to help you position the subject. Try to keep a foreground element to provide perspective and lend distance to the scene. The idea is to keep the photo from being boring. You want a little drama in the shot. There, I did tackle composition a little bit. I still remember those Kodak books "Photography for Beginners" when I was a teenager. Worth reviewing as a refresher course. Go from "model-train-photography" to train photos. 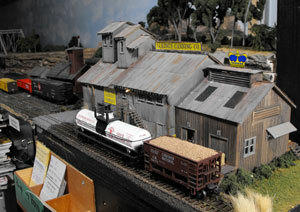 Return from "model-train-photography" to my Home Page.